This is a quick photo tutorial for those who already know how to create an in the pot swirl or have other decorative techniques and formulations under their belt. The vertical side embeds are created on day 1, set for 24 hours and then cut lengthwise (or in a mold with long dividers to evenly space them). 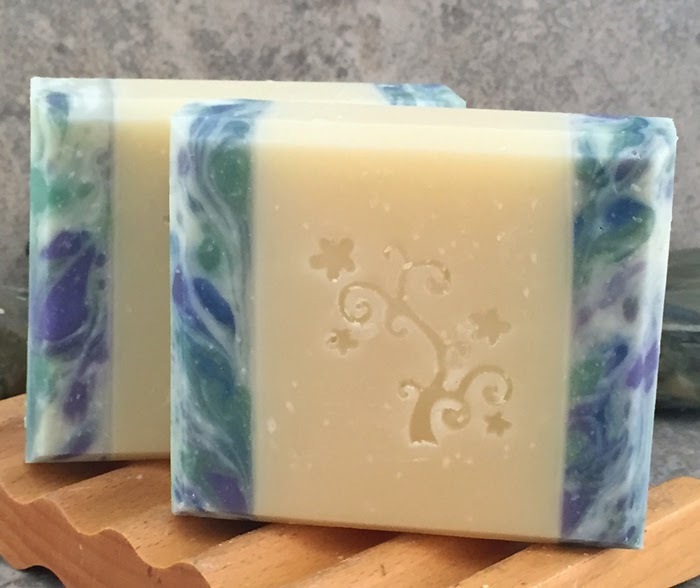 I use the same formulation for the side embeds as I do for the main soap. This is the resulting soap. 1. 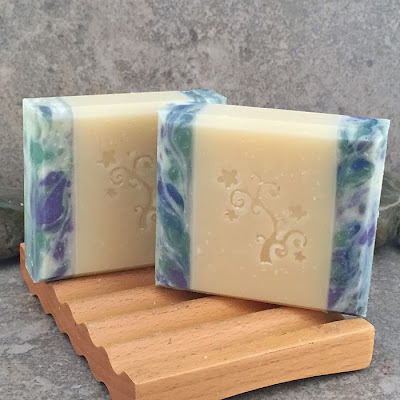 Create a log of soap using an "in the pot" swirl technique. You can really use any technique you want depending on the look you want on the sides. Since they are slim and I wanted lots of swirled colors, I chose this method. You can do color layers, hanger swirls - any technique to get the look you want along the sides. I use a formulation that allows time to create a design, but still sets up in 24 hours to be umolded and cut the next day. 2. 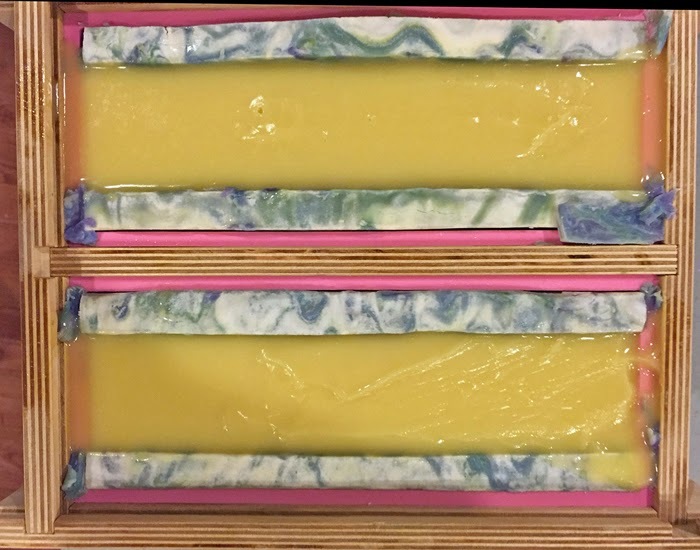 After unmolding and cutting the soap lengthwise into 4 even strips, I place them into them into the mold I am going to use to create the soap. These are 9" long silicone molds from Woodfield's Molds. Excellent quality silicone molds. 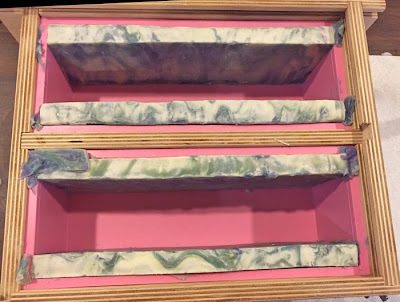 You want them to fit in there snug so they do not move when you pour the center soap. 3. Create another batch using the same formulation, scent and color per your personal preferences. This soap is scented with a combination of Water Lily, Jasmine and Yuzu with no added color. Pour the soap into the mold between the two strips already in place. You want this too be a bit taller than you normally would pour a soap because it is going to have to be trimmed and cleaned up afterwards and you still want to end up with a decent size bar of soap. 4. 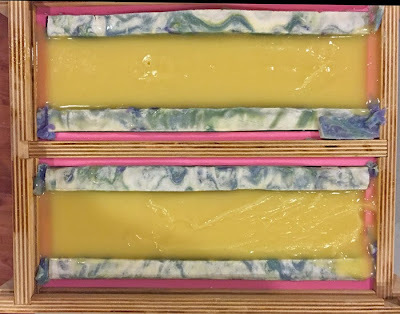 Put the soap to bed (I always gel these soaps to insure that they pieces stick together and have never tried this without allowing the soap to gel) for 24 hours or however long your formulation needs to firm up for unmolding. 5. After 24 hours (or however long it takes for your soap to set up), unmold the soap. 5. Slice the soap into individual bars. You will then need to cut of a slim layer from the top to get a nice smooth surface. 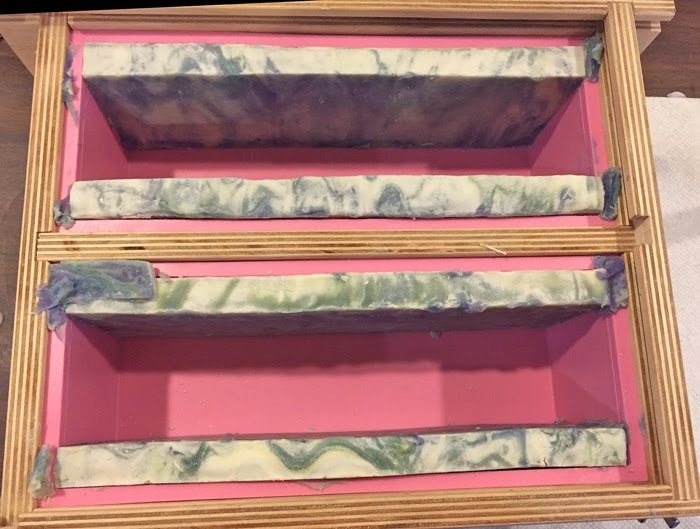 There may be some soap that ended up underneath and on the sides of the colored embeds that will also need to be cleaned up. Continue to trim as per your personal preference. 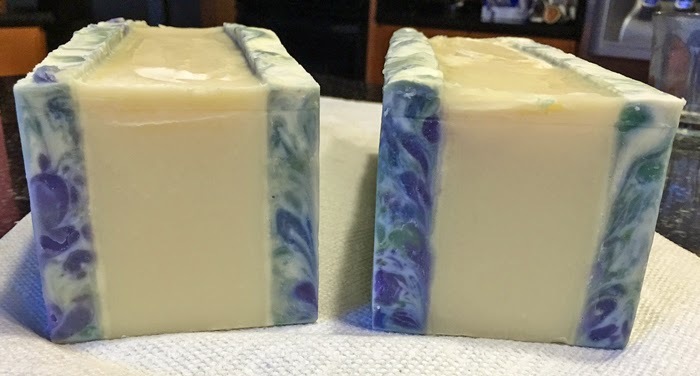 I beveled the edges of this soap and added a stamp.